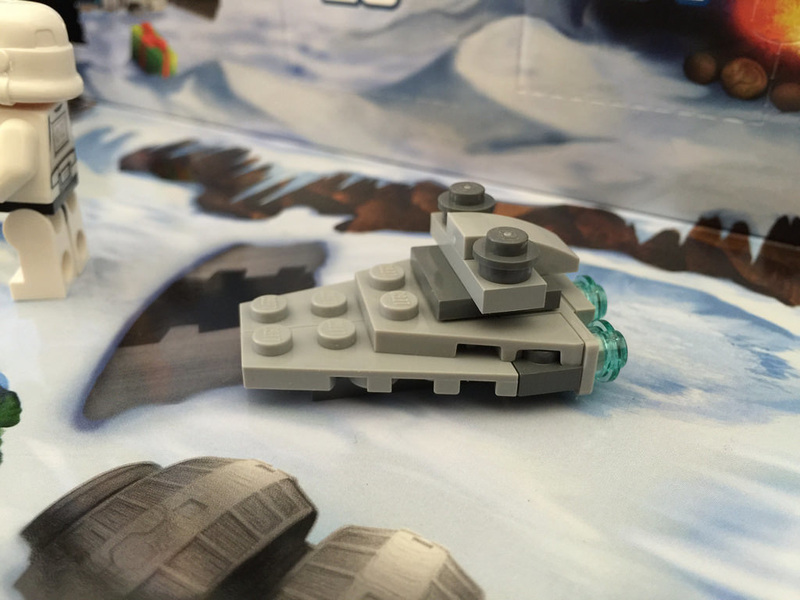 I’m honestly a little disappointed by Jabba’s Sail Barge. If you aren’t a pretty big fan of the movies, then you probably won’t get what this one is meant to be. It’s a little obscure, and doesn’t work at this scale. It looks a little bit odd. 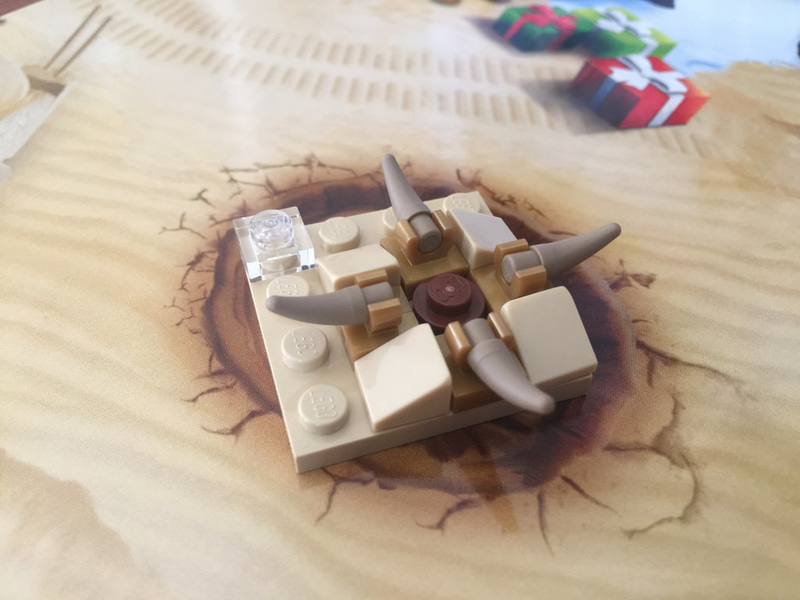 ﻿﻿﻿Day 2 gives us a Sarlacc. It’s a pretty tricky one to build with LEGO, especially at this scale, as we obviously can’t go beneath the surface level. This build is still very effective though, and instantly recognisable as the toothy Sarlacc. 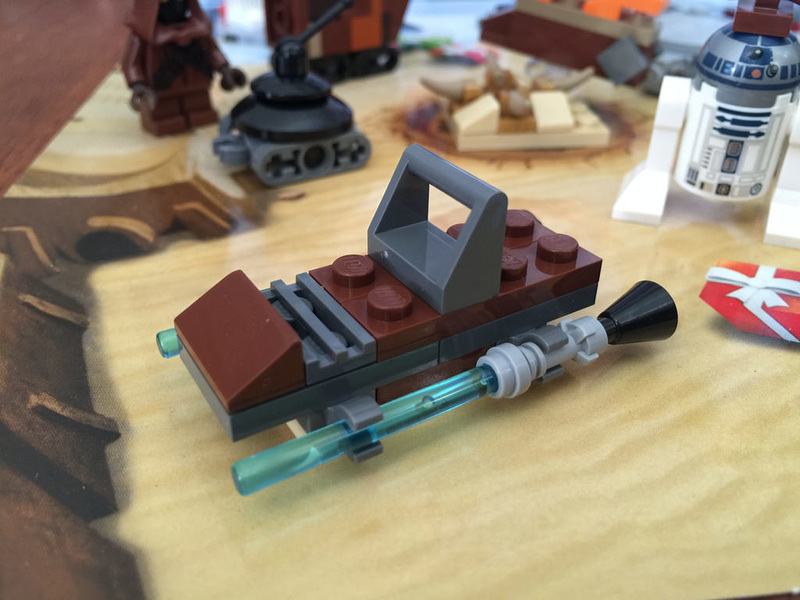 I’m pretty sure the transparent 1×1 plate is for the Sail Barge to sit on. The horns in sand yellow are the rarest types of horn colour, so it’s good to get four of them in this set. Combining this build with Day 1’s Sail Barge makes much more sense, and looks pretty good too. 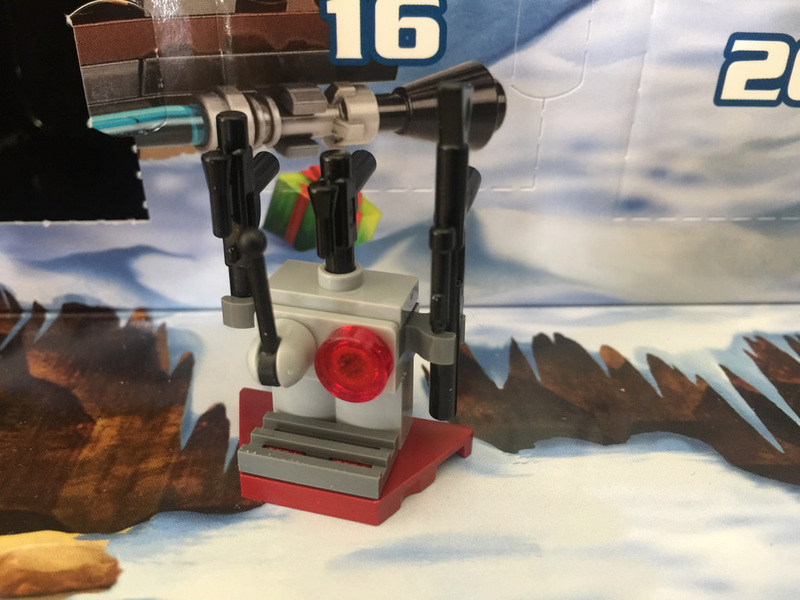 Day 3 brings us a Demolitionmech Droid. It’s a robot from A New Hope, and it took me a long time, and a bit of research on the internet to figure out what it was! Again, I’m not sure if it lends itself to be this small. 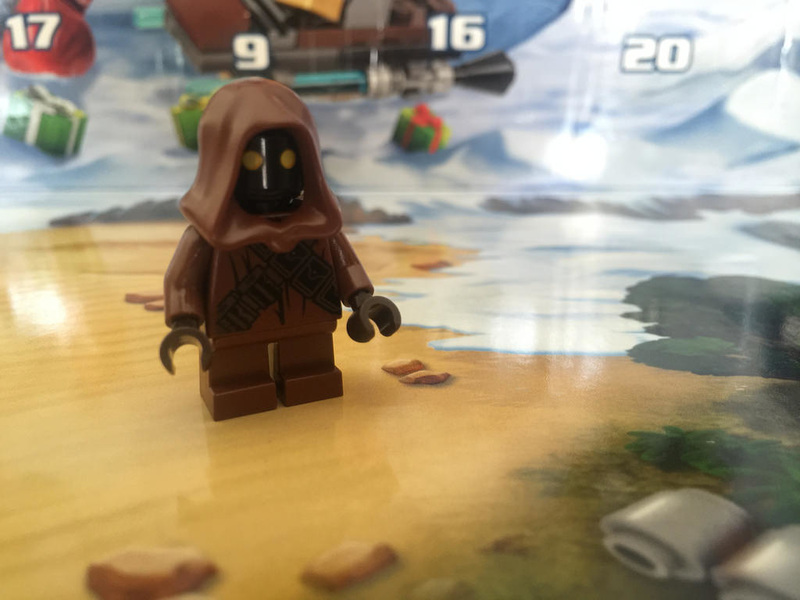 ​We finally get our first minifigure! It’s a little Jawa. The design is the first 2014 iteration, and looks pretty good. I wonder what tomorrow will bring? 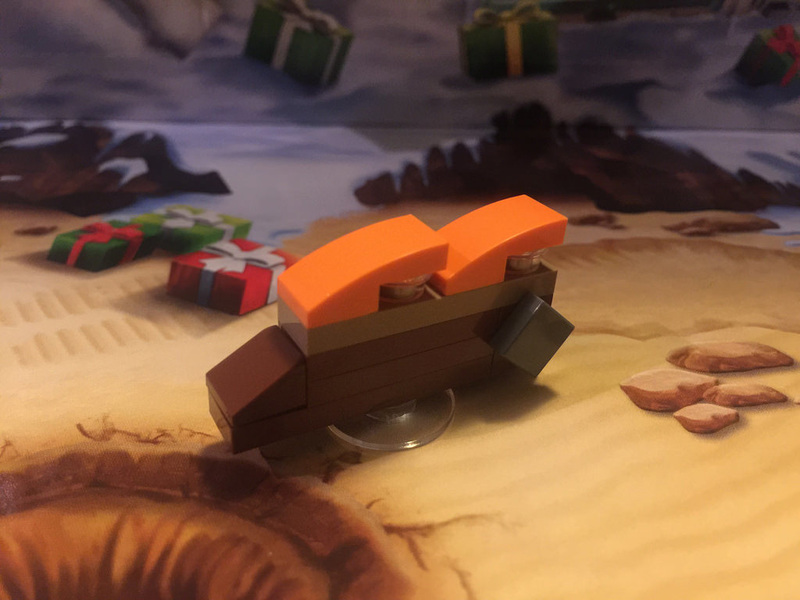 Day 5 is a little Sandcrawler. 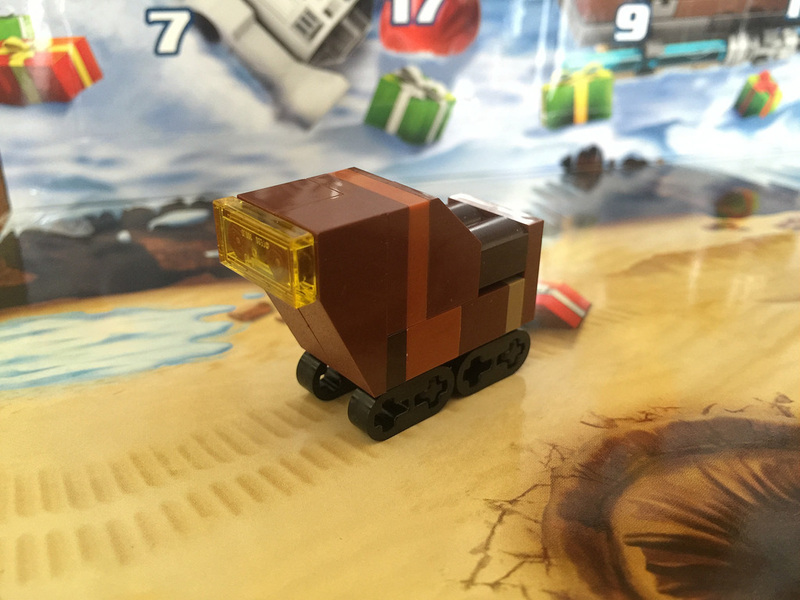 I think this is a brilliant rendition of a Sandcrawler. For such an immense vehicle in the movies, this tiny version really does it justice. With a transparent yellow 1×2 tile at the front for the bridge, and the Technic elements for caterpillar tracks, this is my favourite build so far. The use of different colours in the model is also very clever. From what I can tell, today’s build doesn’t come from any Star Wars movies (I may be wrong – please feel free to let me know!). This Ewok Weapons Rack looks pretty nice. It’s got a clip for a bow and arrow, and a nice plant next to it. I’ve got no idea what the other thing clipped on is though – it kind of looks like a water bottle feeder you give to a guinea pig! Those poor Ewoks. I think I know what’s coming tomorrow! 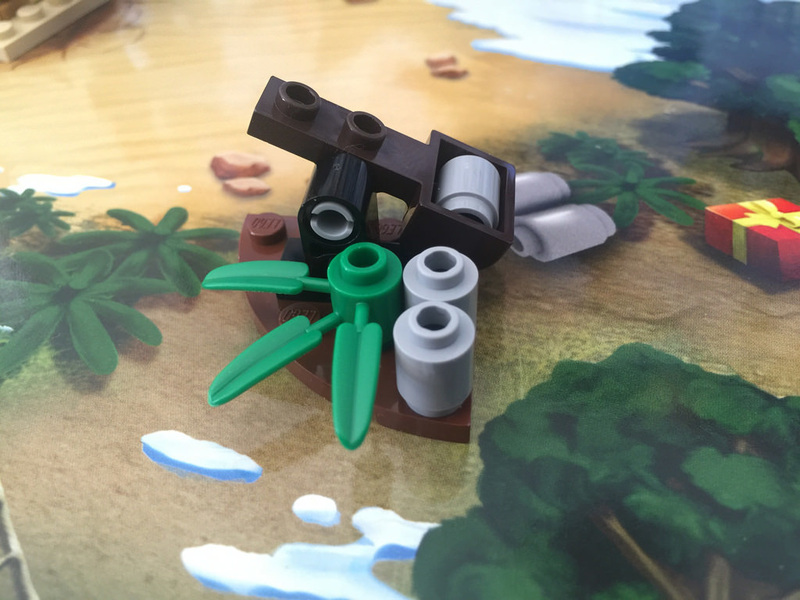 Today we’ve got an Ewok Village micro-build. I was honestly guessing something different today, but maybe that’s tomorrow. This build is great! 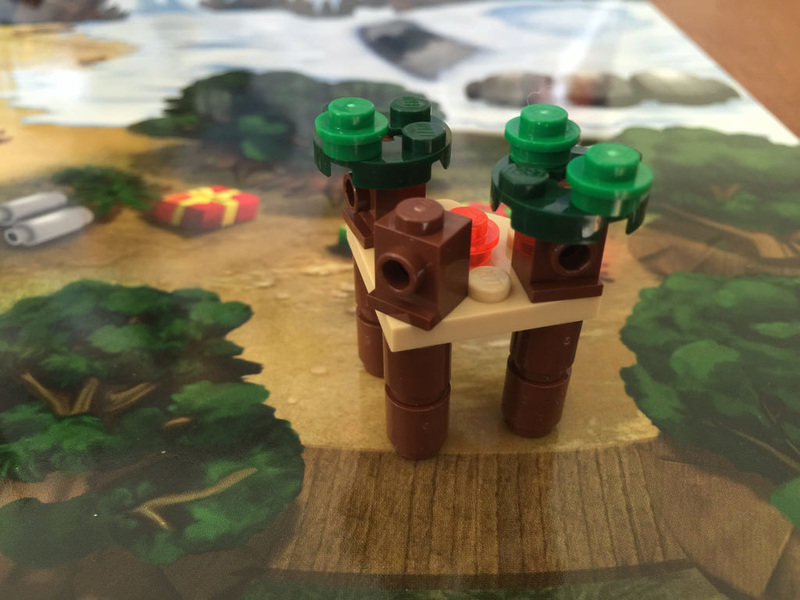 It looks like a tiny version of 10236: Ewok Village, with the three tree trunks. This build looks really clever, and I knew straight away what it was. It’s great! The leaves at the top are simple enough, but really suited to the build and scale. 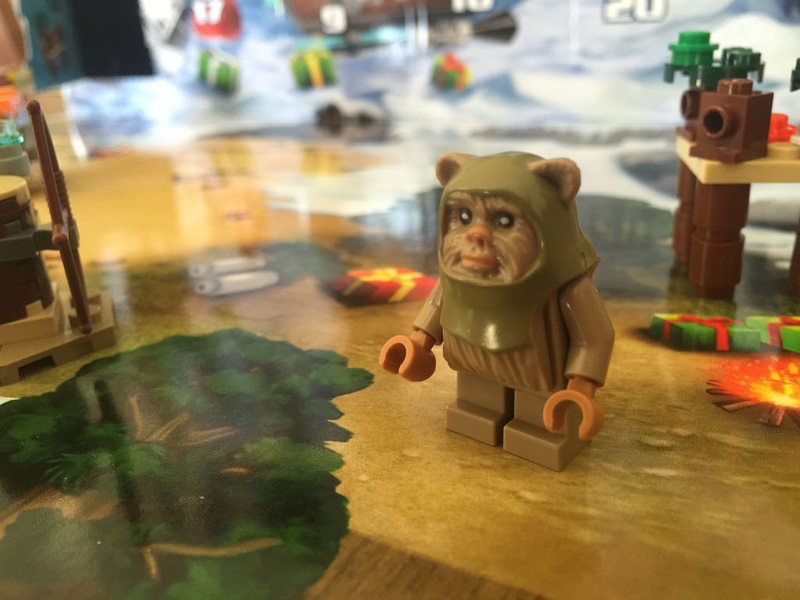 Today’s build was the one I expected yesterday – an Ewok minifigure! I’ve never had one of these before, so I didn’t really know what to expect. I’m pleasantly surprised! The single piece head and cowl is really well crafted. I like the details on the face, and there’s also some nice stitching design on the right hand side. It’s a pretty nice inclusion, and he’s also got some weapons ready to go, thanks to Day 6. In continuation of the last few days of Ewok, today’s build is an Ewok catapult. It’s pretty simple, but I reckon kids would love it. Anything that is able to be shot across a room has got to be a hit. The leaves that come with it are also nice to have – they look good in so many sets. They’re common, but you can never have too many. Hooray for a bad guy! It’s our first Stormtrooper, and it’s a ripper! 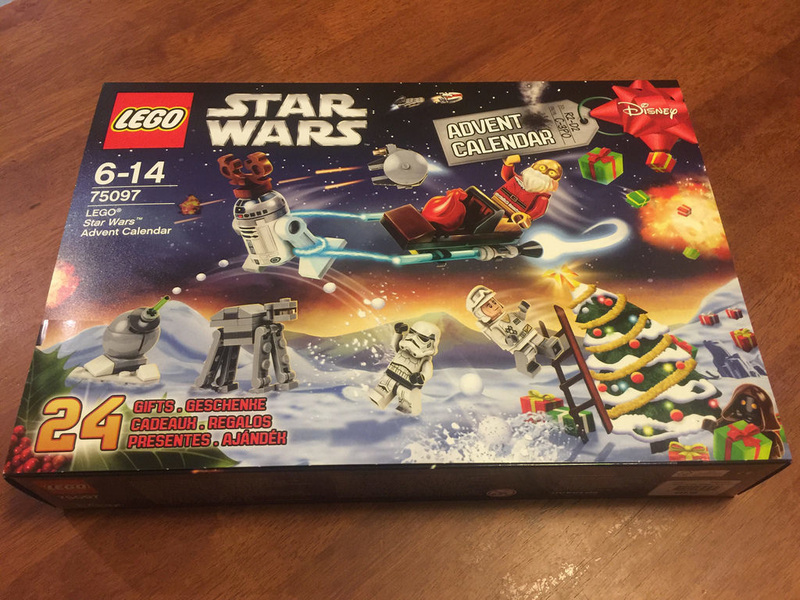 This one is the rare one, with the dark blue bits on his helmet, as it’s only in two other sets – 75055: Imperial Star Destroyer, and 75060: Slave I. I’m stoked. There’s also printing on his back, and on the legs, which is great. Now the battles between the Stormtrooper and the Ewok and Jawa can start, meaning the play options for this set have just jumped up. We’ve got a space ship today, and it’s an iconic one, the Star Destoyer! This looks fantastic at this scale, as there’s enough detail in the bridge and the propulsion system to make it instantly recognisable. This is a brilliant addition to the calendar. 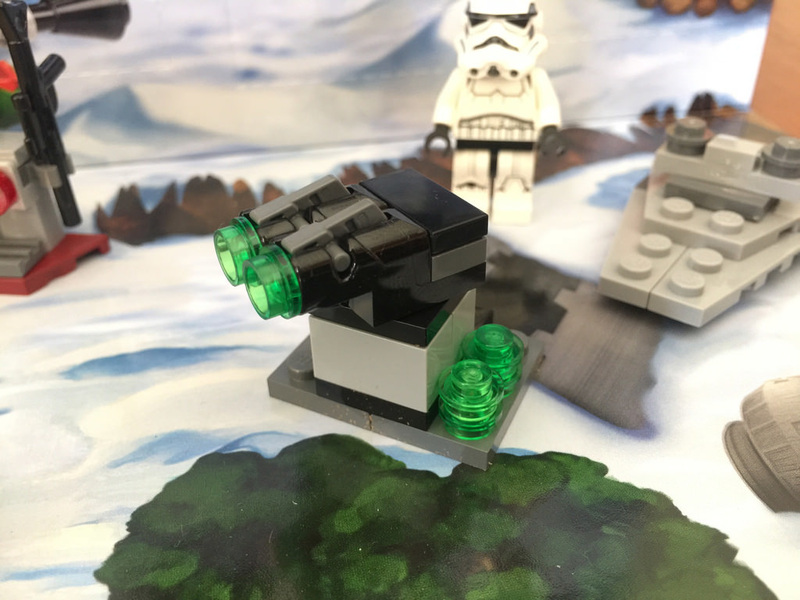 We’ve hit the half-way mark, and we get a blaster weapons rack to celebrate! It’s a little disappointing though, as it’s rather boring. I like the three types of blasters, but I’ve got no idea what the lever and red light is mean to be. Maybe the grate at the bottom is a trapdoor? Today we get the second droid of the set – the Assassin Droid. He’s a bit of a bounty hunter, and quite dangerous too! If you’re not sure what movie this guy is from, I’m pretty sure he’s competition for Boba Fett in Empire Strikes Back. I really like the body and legs, but it is a shame the legs are one piece, so not pivotable separately. Either way, it’s an interesting addition. I like it. Finally! This is probably my favourite build so far. It’s the instantly recognisable Millenium Falcon. It took a bit of sussing out the image to see how it’s put together, and I still am not sure it’s 100% correct, but either way, it looks fantastic. A great use of parts that still means a lot of detail in the finished product. We’ve got a turbolaser turret today. These are the big guns that shoot down the X-Wings in the Death Star Trench Run scene. It’s a pretty great build, with the two plate-mounted stud shooters resting on a swivel plate. They look pretty slick. There’s also a few extra piles of ammo, just in case you lose some under the couch! 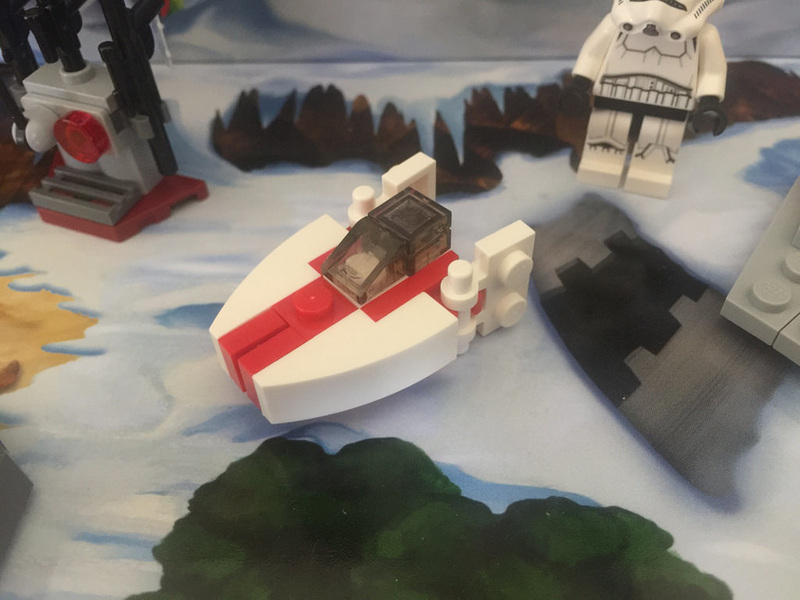 Day 16 gives us an A-Wing Starfighter. It’s a difficult ship to build in LEGO accurately, as the nose of the ship is actually flat, but I think they’ve done a pretty good job. It’s recognisable, and looks pretty cool, especially with the red and white livery. It’s a pretty great build, and having another microbuild ship is always good! 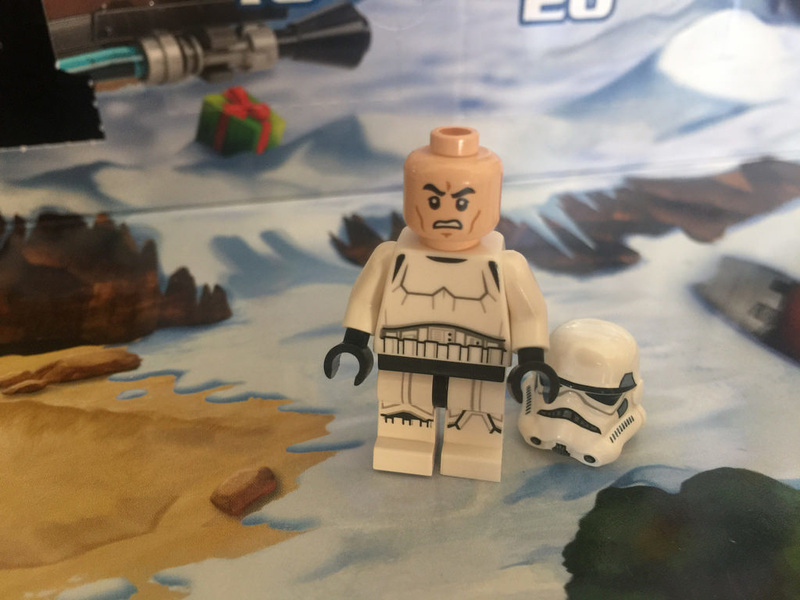 Day 17 is a special day, because we’re getting a brand new minifigure, never seen before! This Hoth Rebel Trooper is all new (apart from the head), and looks fantastic. 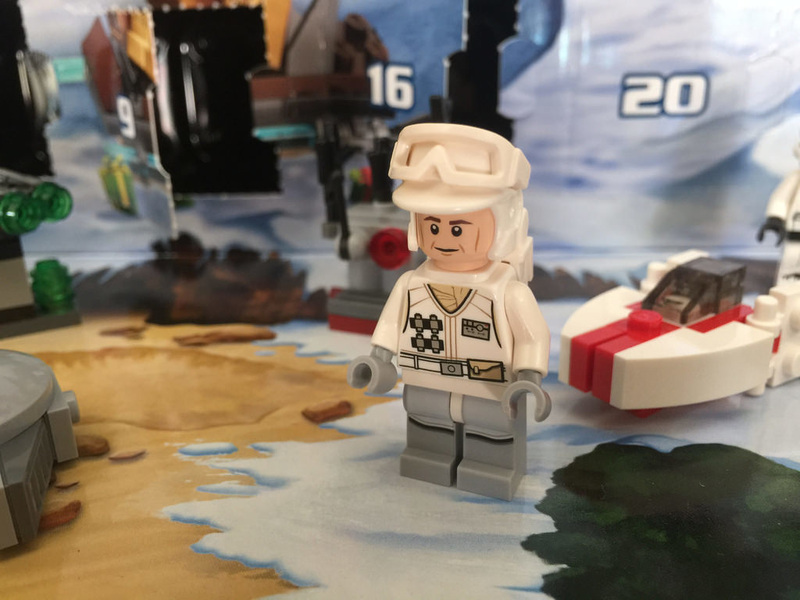 With the new design torso, printed legs and cap, and the not so new goggles (which can be set in two positions) and backpack in white, he looks great. He’s got some nice back printing as well, so check that out before you put his backpack on. Nice work LEGO, and thanks for the spare goggles. 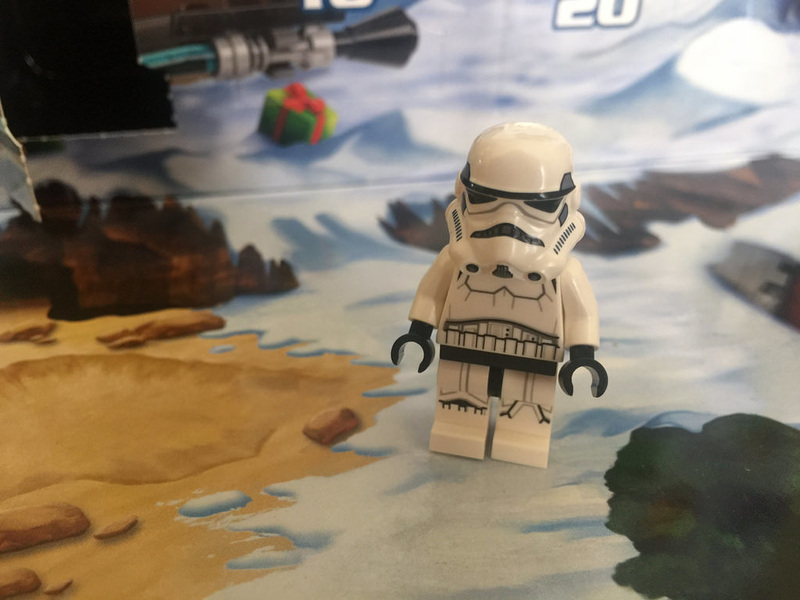 Looking forward to Day 18 – I wonder if we’ll hang around Hoth? It looks like we’re staying in Hoth for the time being, because we’ve got one of the most recognisable vehicles in the entire Star Wars universe, and it appears in the original trilogy too! 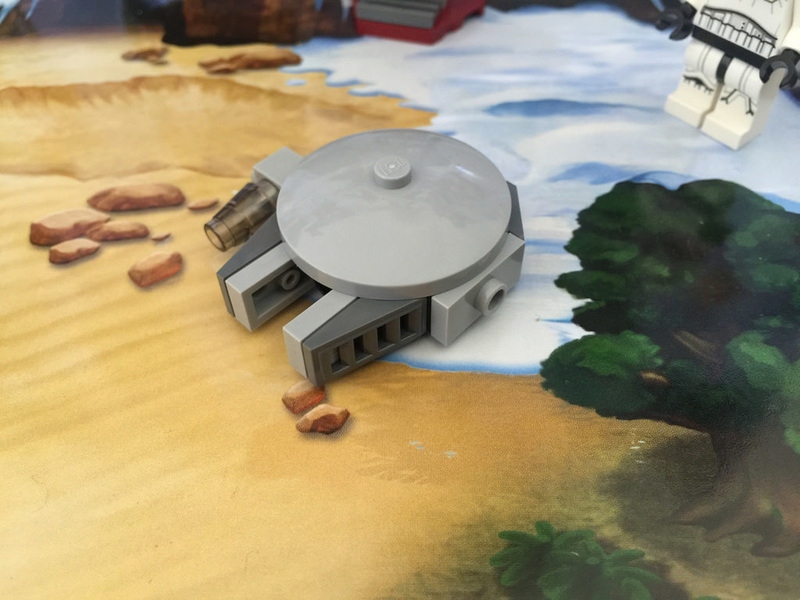 The AT-AT is an incredible machine, and this one is pretty cool too. Admittedly it looks a little weird – it’s head is not right, but it’s hard to get right in micro scale. Never mind, it’s still a cool inclusion. We’re into the last week of the calendar – I wonder what’s left? Today’s build is an Ion Cannon from Hoth. These bad boys were used to shoot down the Star Destroyers, and this one looks great! It’s a brilliant use of the ball and saucer part that I’ve seen before, but have never owned. It means that it can be positioned wherever it needs to go. The one gripe I have though, is that the laser colour is wrong. It should be red, not green. Never mind though, it’s a fantastic addition to the set. Only four days to go! 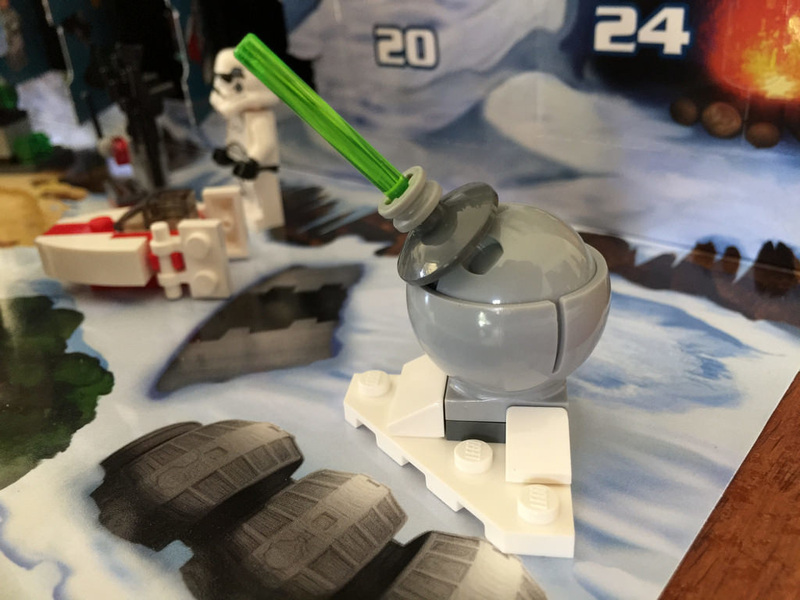 We have four days to go, and the build for the 20th is a probe droid. These are the creepy looking things with long grabby tentacles that first appear in The Empire Strikes Back. I like the use of the transparent elements to make it look like it’s floating. It’s a simple build, but looks great. I honestly have no idea what this is. Is it a weapons rack? A blaster console? I’m going with the console option, as there’s the control pad there. 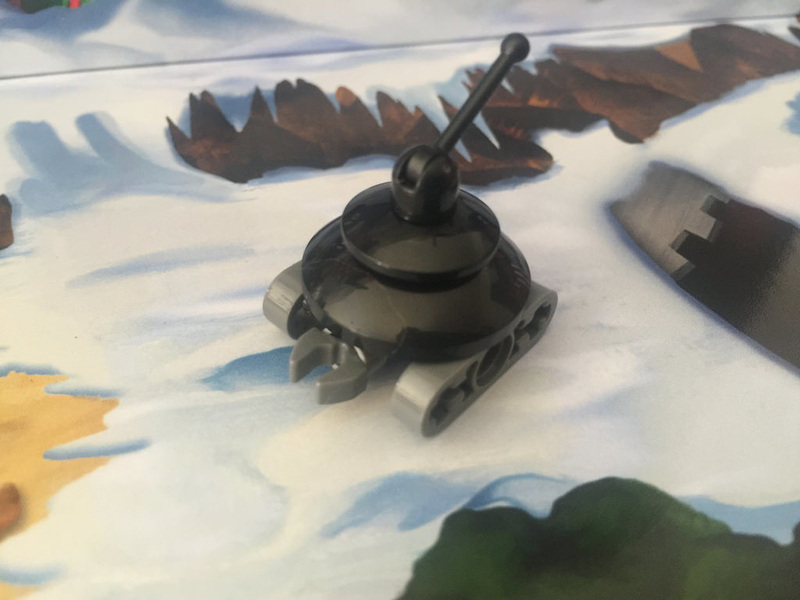 It’s a bit of a dull build, but the stud shooter is always good, as kids love shooting them around, and the printed 1×2 plate is perfect timing for me as I don’t own one, and want to build a mini version of Wall-E. I’m happy, but disappointed at the same time. It’s our first Christmas themed build today, and we’re almost at the end! 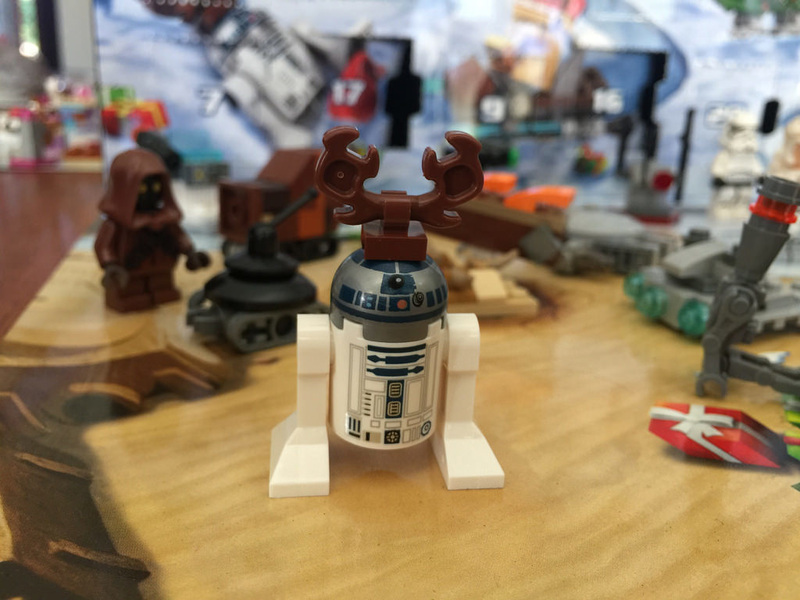 Today we get a reindeer-antlered R2-D2. He looks brilliant, and the printing is superb. The antlers are brand new in this colour, and are in red in only three other sets, so it’s a very rare piece – even better is we get two of them! One comes as a spare. I think it’s a massive bonus. 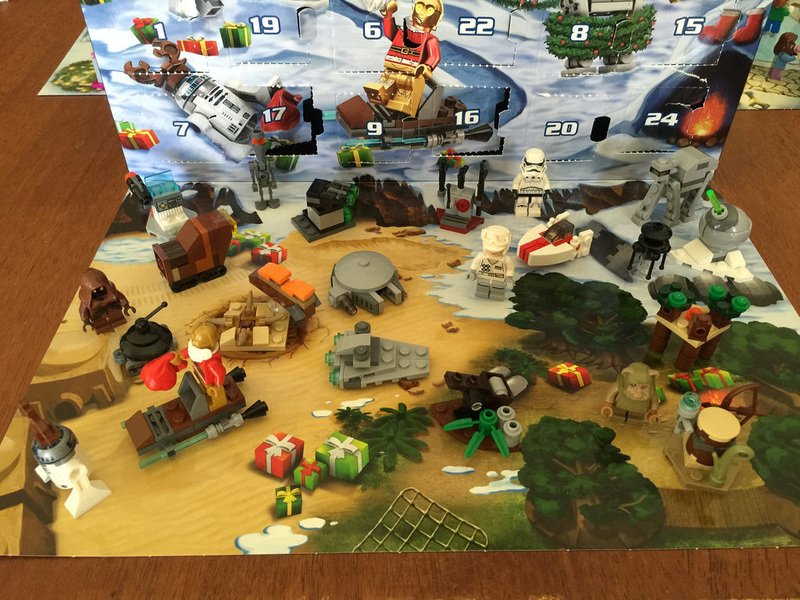 The second last day of the Star Wars Advent Calendar gives us a lightsaber powered sleigh. I think it looks great, and we finally have some lightsabers! I have no idea how they don’t cut the sleigh to pieces, but that’s why imagination is great. It doesn’t have to make sense! We all know what tomorrow’s build is going to be, so no points for guessing, but I’m pretty happy with this one. 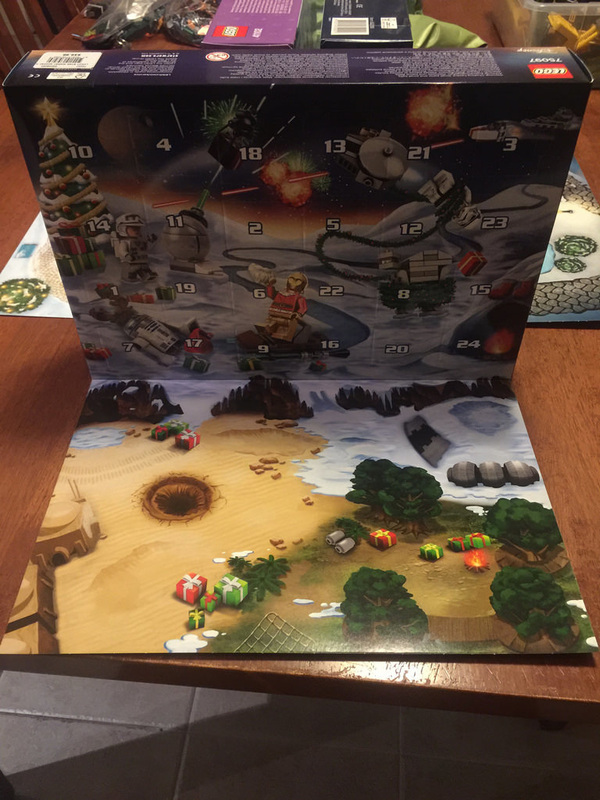 It’s unique, Christmas, and Star Wars all rolled into one. Today is the day many of us were waiting for – the new Santa dressed C-3PO. 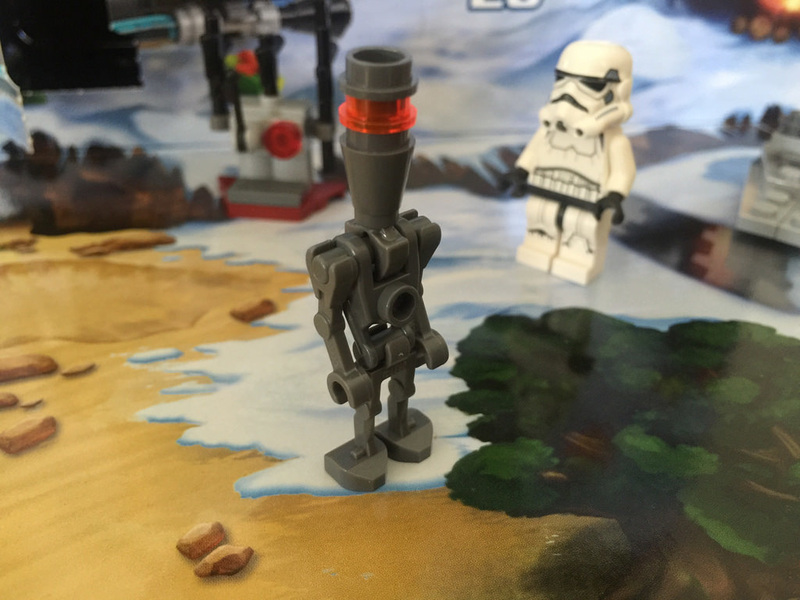 His torso is brand new, and the legs and head have only been seen in last year’s 75059: Sandcrawler. It’s a very special build, that looks great. 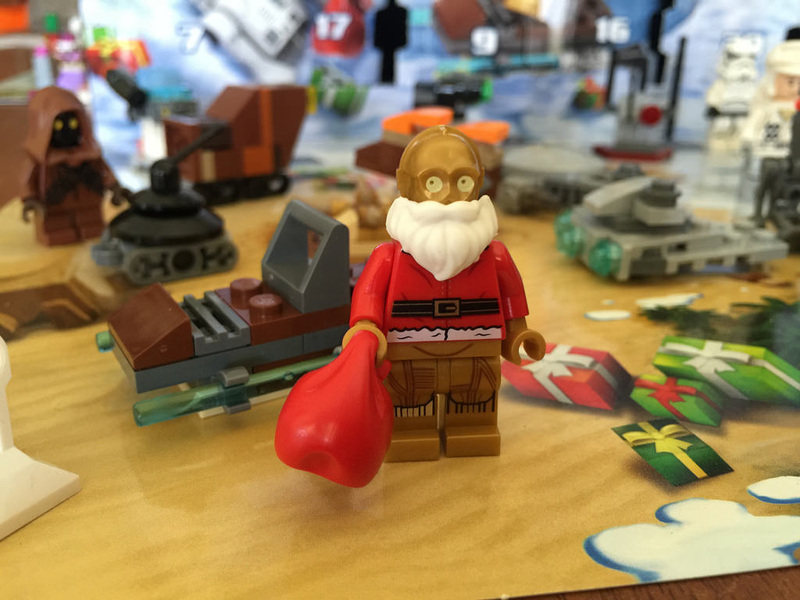 The sack is also quite rare, as the red one is only in one other set – 10245: Santa’s Workshop. What a day! And that is that! I’ve had heaps of fun building this each day. 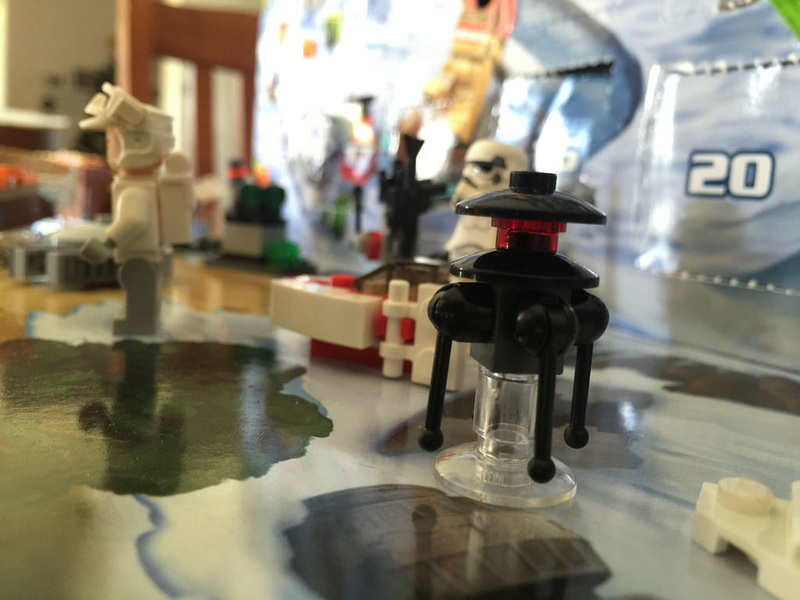 It’s great to wake up with some LEGO over breakfast each morning! Because I’ve covered my usual review process in many of the daily posts throughout December, I’ll be outlining the best and worst days in my opinion, and also give a final score. 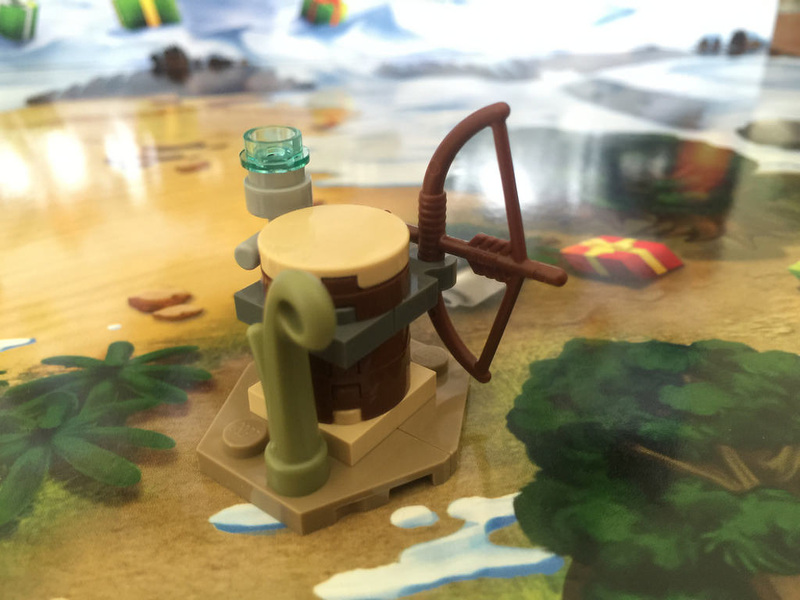 This set has some great builds, so this is difficult! 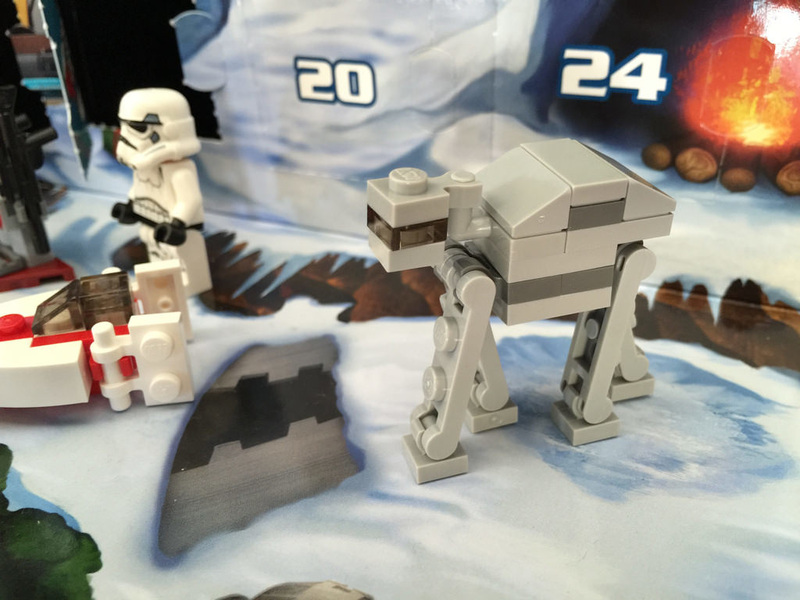 Apart from today’s extra special one, Day 18’s AT-AT was great. It looks top notch, and is very posable. 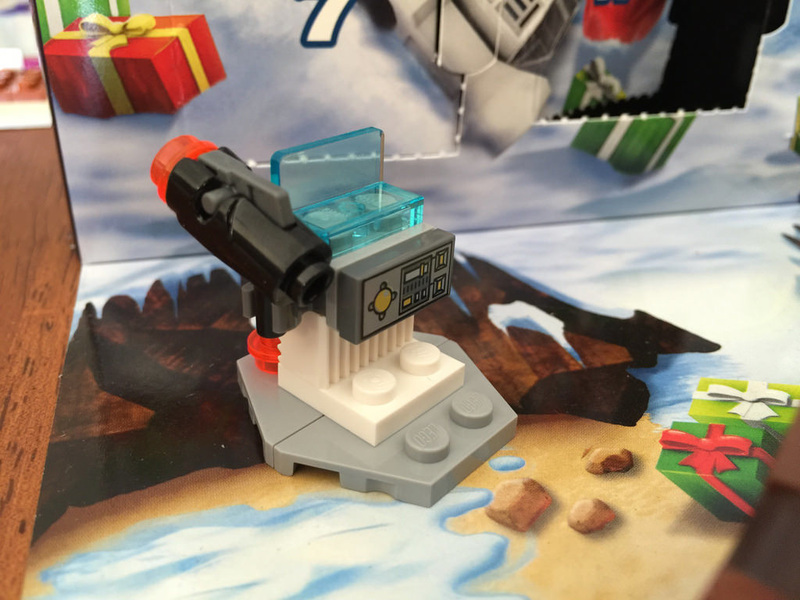 Day 21’s blaster console is probably the worst, purely because it’s not from any movie as I recall. It’s a little weird. It does have it’s redeeming qualities though, so again, another tricky pick. While I don’t have that much of a Star Wars collection, the elements have been really good. Lots of new things to have. There are spaceships – enough said. No, there’s also weapons, good and bad guys, a sleigh and a catapult. Lots of epic battle recreations to get stuck into. Some clever stuff here, and not just bricks on bricks! Great to see that even the little builds can be SNOT. Many builds are instantly recognisable. Some are very strange, and are a bit of a stretch of the Star Wars universe, but it’s Christmas, so whatever. Great value for money, with a long build time over many weeks. Definitely collectible! Happy Christmas everyone, and enjoy the new Star Wars movie! Holidays are the perfect time to see it.